Dozens of Israeli soldiers invaded, on Thursday at dawn, Jenin refugee camp, in the northern West Bank city of Jenin, shot and injured four Palestinians, including three children, and abducted two others, during protests that took place after the soldiers stormed and searched homes. Media sources in Jenin said the soldiers invaded and ransacked many homes in the refugee camp, before dozens of youngsters took to the street, and started throwing stones at the army. 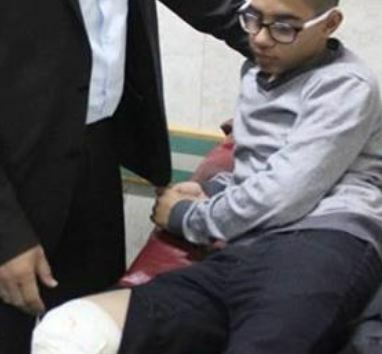 They added that the soldiers shot three children and a young man with live fire, before local medics rushed them to Khalil Suleiman governmental hospital in Jenin, suffering moderate wounds. Furthermore, the soldiers abducted Mahmoud Morad Sa’adi, and Ashraf Salah Turkman, from their homes in the refugee camp. It is worth mentioning that dozens of soldiers were deployed around many villages and towns in Jenin governorate, especially surrounding Qabatia, Mothallath ash-Shuhada, Burqin, Kafr Qud, Khirbat an-Najjar and Umm at-Tamel.